Leighton Baines is not your conventional Premier League footballer. He certainly doesn’t fit into the identikit Nando’s scoffing, Chinawhites partying, media savvy wideboy who dominate the landscape of Premier League footballers. Baines is a quiet kid who lets his football do the talking, with one of his few ventures into the media being his fantastic music blog in which he refreshingly reveals his favoured bands as Pink Floyd, the Velvet Underground and The Coral….with no mention of Phil Collins. The Left sided marauder was on the Toffees’ books as a teenager, but eventually joined Wigan’s school of excellence and made his senior debut at the age of 17 for the Latic’s. After earning rave reviews at the JJB, notably for a delicious 30 yard free kick against Manchester United, he was rewarded with a big money move to L4. Baines has improved season on season, and he finished the last campaign on song, recording nine assists – the highest number for a Premier League defender in the last decade. In this campaign he has already matched that figure and its not surprising when you look at the positions he gets into high up field. The below screenshot is a nice example of the telepathy Baines had with the now departed Pienaar, bombing up the wing in the space created by the South African dragging his marker inside. Everton’s left side has been our key strength and significant weakness this season. The reasons behind this have been talked about on the blog week in week out, but the below charts get the message across quite succinctly…. *Origin is determined as the source of the goal, so for instance Beckford’s goal v Blackpool was from a left wing cross so would be classed as left. Sturridge’s goal for Bolton was from an up and under from the centre circle so will be classed as Central. Ashley Cole and Patrice Evra have been the benchmark left backs in the Premier League for several years now, and below is a snapshot analysis of their statistics this season in comparison to Leighton Baines. There is also a short analysis on the key findings broken down into crossing accuracy, tackling and passing. 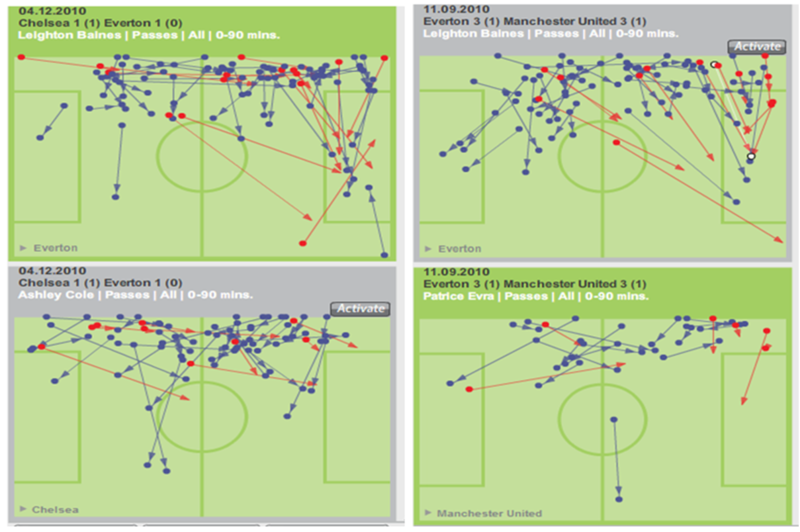 Baines v Cole/Evra this season Passing Chalkboards…. Baines tackling completion this campaign stands at 71%, which is a 6 % improvement on his figures last term, although still behind Evra, who steams in at 77% completion. Baines has been amongst Everton’s top 3 tacklers for most of the campaign, with only Seamus Coleman and Marouanne Fellaini currently boasting a better completion rating. 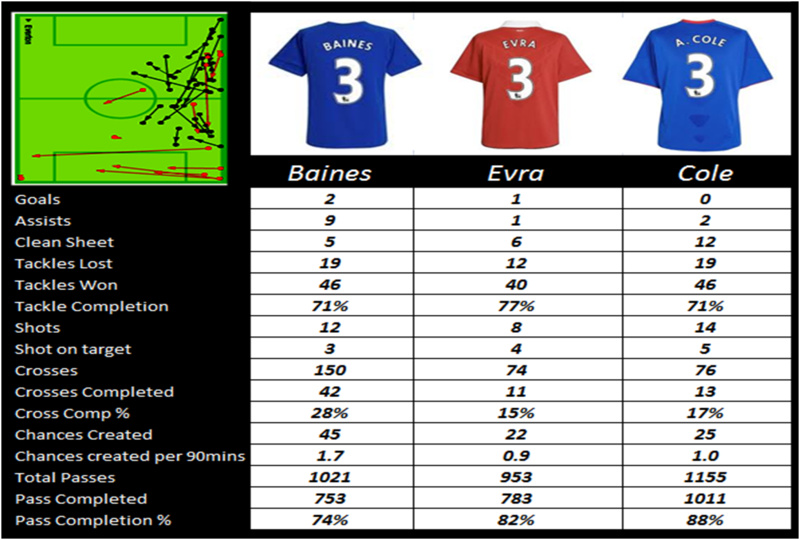 In terms of passing, Baines is lagging behind Cole who boasts an impressive 88% pass completion. At 74% completion Baines passing is decent for Everton, with our average pass completion per game this season just under 75% with our opponent’s average 69%. To put that into context, Iniesta from Barca’s pass completion is 89% with the La Liga average around the 82% marker for this season. In terms of creative passing, Baines creates an opportunity for an opponent 1.7 times per game. This is a 0.6 improvement on his rate from the season we reached the Cup Final in 2008/9. This figure is also considerably better than Cole who averages a key pass 1.0 per game and Evra 0.9 per game. In fairness to Cole and Evra, Baines is arguably our key creative force this campaign with Pienaar gone and Arteta out of sorts, so our tactics are often manipulated to get Baines into opportunities higher upfield, whilst United & Chelsea have more players capable of a creative spark in their ranks.